5. With pendant drop at the correct length for your installation, feed cable through cable gland nut, cable grip and centre tube of the alarm. 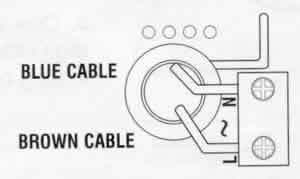 Connect as shown below (blue: N, brown: L) ensuring conductor is clamped between washer and bush, with no visible strands showing. 6. When connections have been made, slide cable gland nut and grip up to main alarm body. Tighten clockwise to clamp cable to alarm unit. Allow some slack on cable in main body thus ensuring the weight of the lamp and lampshade is supported by the grip assembly and not by the connection terminals.